The growth of the global market for bulk material handling products and technologies heavily relies on the rising industrial infrastructure and the movement in the construction sector, especially in the emerging economies. The increase in the automation in the manufacturing industry and the advent of the mass production methodology and the assembly line concept have been acting as the key driving factor behind this surge in this market in the recent times. Furthermore, the rise in mining activities, progress in the agriculture industry, and the innovations and advancements in bulk material handling products and technologies are likely to propel this market over the forthcoming years. 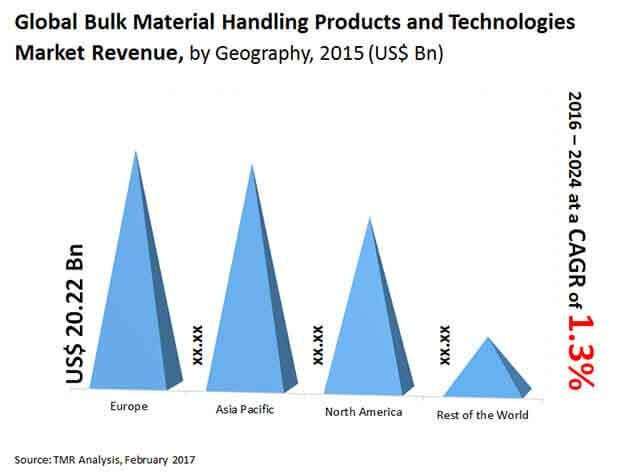 The global market for bulk material handling products and technologies offered an opportunity worth US$58.86 bn in 2015. Analysts project this market to expand at a CAGR of 1.30% between 2016 and 2024 and reach a value of US$65.74 bn by the end of 2024. The worldwide bulk material handling products and technologies market is spread across North America, Asia Pacific, Europe, and the Rest of the World that includes the Middle East, Africa, and South America. Europe has been holding the lead in this market for quite some time and is expected to retain it over the next few years. In 2015, the Europe market for bulk material handling products and technologies accounted for a share of 34.4% in the overall market. Germany, among all the European markets, has surfaced as the most attractive market for bulk material handling products and technologies. The increasing demand for industrial automation, which require extensive usage of bulk material handling equipment, rise in mass production methods, such as assembly line production, and the growing need for bulk equipment in the construction industry has boosted this domestic market substantially. Among other regional markets, Asia Pacific is demonstrating signs of strong growth in the near future. The Asia Pacific market for bulk material handling products and technologies is largely acquired by China, which is one of the most prominent domestic bulk material handling products and technologies market across the world. Researchers expect the china market to expand considerably in the years to come and have a significant impact on the Asia Pacific market. The market in North America, on the other hand, is anticipated to experience sluggish rise over the forthcoming years. The chemical, construction, food and beverages, energy, mining, oil and gas, metals, pharmaceuticals, and the plastics industries are the key end users of bulk material handling products and technologies across the world. The demand for these products and technologies has been most prominent from the mining industry, which has been closely followed by the construction and the chemical industries. According to analysts, the scenario is likely to remain so in the near future. Metso Corp., TRF Ltd., Tenova S.p.A, ThyssenKrupp AG, SENET, Voith GmbH, and FLSmidth & Co. are some of the prominent players in the global market for bulk material handling products and technologies. Increase in demand for different types of bulk material handling products such as conveyor belts, stackers, reclaimers, and spreaders for process automation across various industries has fueled the growth of the market for Bulk Material Handling Products and Technologies. Growing demand for bulk material handling products & technologies in the mining and chemical sectors globally has fuelled the growth of bulk material handling products & technologies market. Moreover, bulk material handling products and technologies are also used in the agricultural farms for the storage and movement of crops and powder bulk materials. Modernized, automated machineries for handling bulk materials are largely being used in the chemical industry to carefully handle the hazardous chemical wastes. Furthermore, the need of assembly line in the manufacturing sector is also driving the bulk material handling products and technologies market. In addition, pharmaceutical industry needs bulk material handling products for product containment, feeding reactors and stirrer containers with basic chemicals. Moreover, with the growing need for automation in manufacturing industry, it creates a huge demand for material handling equipment. In order to carry out the automation process, manufacturers need bulk material handling equipment. Opportunity for bulk material handling product market lies in this sector because the pharmaceutical industry is growing at a constant rate and this would increase the demand for bulk material handling products. The increase in automation in the manufacturing companies is driving the growth of the market; as the bulk material handling equipment is an integral part of the automation process. Thus, increasing global demand for mining activities and production automation is fueling growth of the bulk material handling products and technologies market. However, high initial cost and low technological penetration are the major restraints in the growth of global bulk material handling products & technologies market. Based on type, the market has been segmented into powder materials and others. Powder materials are segmented into material feeding systems, weighing systems, conveying systems, and screening systems. Based on end users, the market is segmented into chemical, construction, energy, food & beverages, mining, metals, oil and gas, pharmaceuticals, plastics among others. Geographically, the global bulk material handling products and technologies market is categorized into North America, Europe, Asia Pacific and Rest of the World (ROW). The market for bulk material handling products and technologies has been provided in (USD Billion) in terms of revenue as well as the CAGR for the forecast period of 2016 to 2024. The report also provides breakdown and assessment of various factors impacting the global bulk material handling products and technologies market growth, which are suitably described as market drivers, restraints, and opportunities. These factors determine various existing trends and their impact on market growth. Overall, taking into consideration the various factors affecting the bulk material handling products and technologies market, the report includes a holistic analysis of the global bulk material handling products and technologies market, and provides an estimate of growth for the forecast period 2016 to 2024. Moreover, after taking into consideration all this factors, an extensive analysis of the region wise growth parameters of the market along with the overall assessment for the forecast period of 2016 - 2024 has been also been provided within this report. Furthermore, the report includes the porter’s five forces and value chain analysis. Moreover, patents analysis is also included in the scope of the research. The companies involved in this market are concentrating on new product innovation through research and development activities along with strategic alliances with other companies for increasing product portfolio is one of the major strategies adopted by the companies. Some of the leading players of the market are ThyssenKrupp AG (Germany), Metso Corporation (Finland), FLSmidth & Co. (Denmark), TRF Ltd. (India), Tenova S.p.A (Italy), SENET (South Africa), Voith GmbH (Germany) among others.